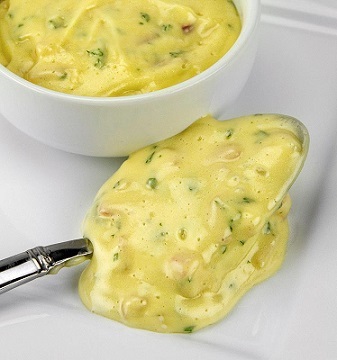 Bearnaise Sauce is a variation of Hollandaise Sauce. The major difference is that tarragon - wine vinegar reduction is part of the Béarnaise. 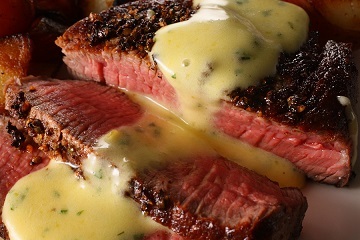 It is a traditional sauce for steak but Béarnaise is a wonderful sauce for almost all meats, vegetables, some seafood, and potatoes. Restaurant customers (my guests) absolutely love this sauce with grilled wild King or sockeye salmon. 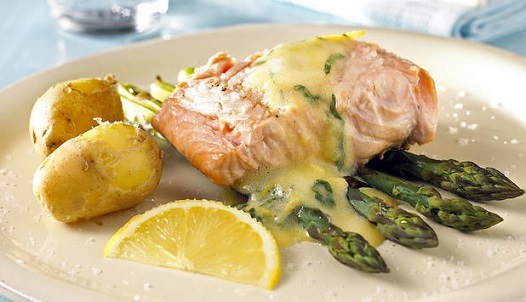 Béarnaise sauce may not be the best choice for most egg dishes. I prefer using Hollandaise Sauce with egg dishes. And, if you are into a low carbohydrate diet, you're going to be fine using this sauce recipe. To make this sauce successfully, you must carefully control the heat. Too high heat will cause the egg yolk to curdle. If the heat is too low, the sauce will probably not thicken properly. And if you add the butter too quickly while cooking, the mixture may separate and ruin your sauce. Enjoy your restaurant sauce for Bearnaise and the food you marry with it and the company of those you share it with! 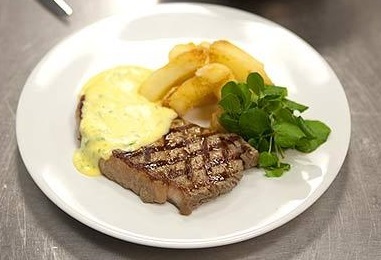 "A Béarnaise sauce is simply an egg yolk, a shallot, a little tarragon vinegar, and butter, but it takes practice for the result to be perfect." "We Americans are mildly interested, of course, in reading about the discovery of radium by Madame Curie, but what we really yearn to know is the name of the un-commemorated French female who first mixed a sauce Bearnaise."